The Oliver Twins' latest addition to their seemingly endless list of games is yet another simulator (how can sticking 'simulator' on the end of a game title increase sales?). 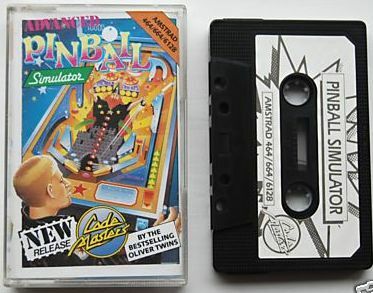 It's just like one of those good old pinball machines that you find lurking in the darkest recesses of amusement arcades, only it doesn't cost you by the game. One to three take part. To the right of the screen is a score panel for each player and how many balls they've got left. Most of the rest of the screen is taken up with the pinball table. Each player has three balls to start with and one is lost if it drops out of the bottom of the screen. Lose all three and the game ends. You have four flippers: two right and two left. One key operates each pair of flippers. Not only is there the high score objective. but there's also an objective to defeat an evil wizard (bring back the good wizards). A spell book appears when you light up the letters of MAGIC and it opens if you do it again. A weather potion and a magic cottage also lurk somewhere on screen. There's the traditional bit of Oli-speak on the title screen and the sounds effects within the game are pingy and boingy (no relation to Pinky and Perky). There's a good title tune and the odd tune (and I do mean odd) during play. The background graphics are dull and uninspiring, and the only moving graphics are the ball and flippers. Pinball may not seem the most likely game to come out on a computer, but at least it's more fun than a fruit machine. It plays reasonably well and should keep you occupied for a while. But it won't take long to tire of it. » Topic: Cheats, pokes ou solution pour "ADVANCED PINBALL SIMULATOR"